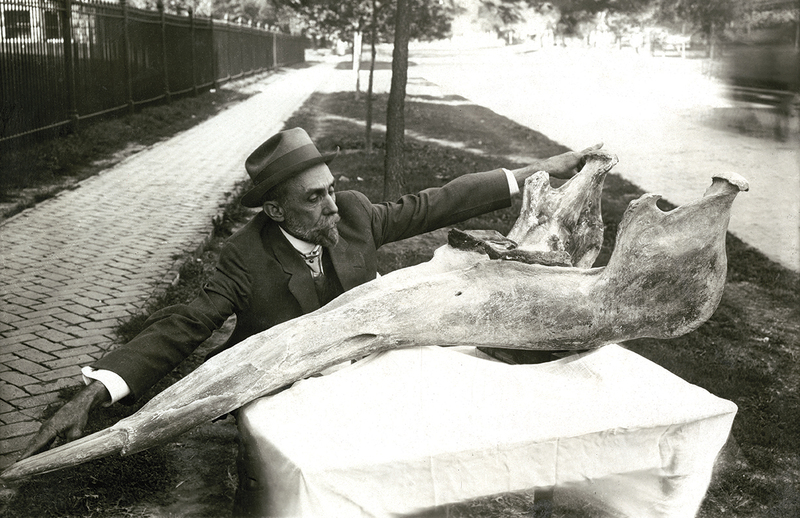 University of Nebraska paleontologist E.H. Barbour informally measures a gomphothere specimen. This photo will be part of the exhibition "Lost World of E.H. Barbour: Renaissance Man on the Plains," opening June 3 in Love Library South. The University of Nebraska-Lincoln's Love Library will host the photo exhibition "Lost World of E.H. Barbour: Renaissance Man on the Plains" from June 3 to Aug. 10 in the second-floor lobby of Love South, 1248 R St. The library will celebrate the opening from 5 to 7 p.m. June 3 during Lincoln's First Friday Art Walk. The exhibition provides an introduction to Barbour's interest in natural resources, the Lincoln and university community, and travel. It includes more than 40 black-and-white photographs gleaned from the thousands Barbour took throughout Nebraska and during his many trips in the United States and abroad. Barbour was an early faculty member of the University of Nebraska, beginning his career in 1891 and retiring in 1941. Throughout his life and career, Barbour focused on the development and study of paleontological and geological resources in Nebraska and the Great Plains. The exhibition is the first of two planned collaboratively between the University of Nebraska State Museum and the University Archives and Special Collections in UNL Libraries. For Love Library hours, click here.